Heart failure patients who allegedly suffered complications related to recent recalls for the Heartware Ventricular Assist Device may be entitled to file a lawsuit to obtain compensation for medical bills, lost wages, pain and suffering, and more. The nationwide law firm of Bernstein Liebhard LLP is now offering free legal reviews to individuals interested in filing a Heartware Ventricular Assist Device lawsuit. Please call (888) 994-5118 to get in touch with our legal team today. Heartware Ventricular Assist Device: What’s the Problem? 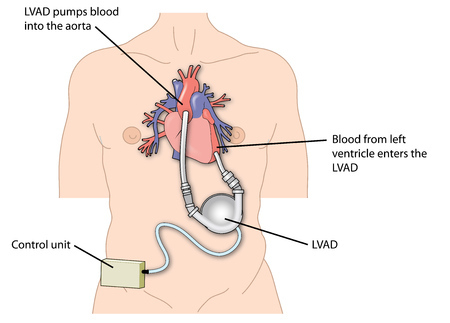 The Heartware Ventricular Assist Device (HVAD) is surgically implanted in patients awaiting heart transplant and who are at risk of death from end stage left ventricular heart failure. The system can be used in or out of the hospital setting, and includes a pump implanted in the space around the heart (pericardium) and a controller to regulate the function of the pump. The Heartware Ventricular Device has been involved in a number of safety recalls, several of which were granted Class I status by the U.S. Food & Drug Administration (FDA). Class I is the agency’s most serious recall category, and indicates that use of a device could result in serious injury or even death. Most recently, a Class I recall was announced for Heartware Splice Kits designed to repair the driveline on the HVAD should an electrical break occur. According to the May 2017 recall notice, the splice kits suffer from a design problem that may prevent the repaired cable assembly from withstanding excessive force or pull. This may damage the cable assembly and interrupt the electrical connection, leading to serious adverse events or death. In October 2016, a Class I recall was issued for HeartWare Controllers due to a power connector problem that could cause the rear portion of the pump’s driveline connector to become separated from the front portion. The recall was expanded to include Heartware DC Adapters in May 2017. A loose HVAD connector may allow moisture to enter the controller, resulting in corrosion, electrical issues, reduced speaker volume and connection failures. A loss of connection could also cause the pump to stop, resulting in death or other serious adverse health consequences. While no amount of money can truly make up for the suffering of injured victims, damages from a Heartware Ventricular Assist Device lawsuit could provide the financial resources patients and their families need to recover physically, emotionally and financially from their injuries. To obtain a free, no obligation review of your potential claim, please call (888) 994-5118 to contact our attorneys today.